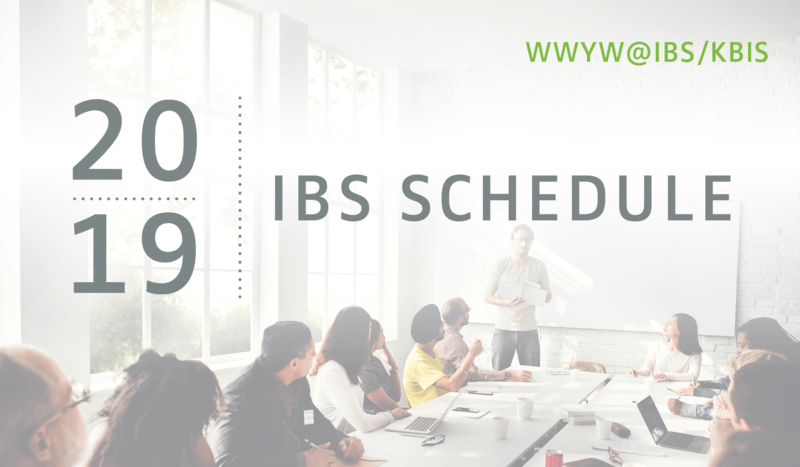 The WWYW Schedule at IBS may be subject to change. Please check back for updates. We’ve recently released our next six Atlanta 4-Course dates. We look forward to having you join us. 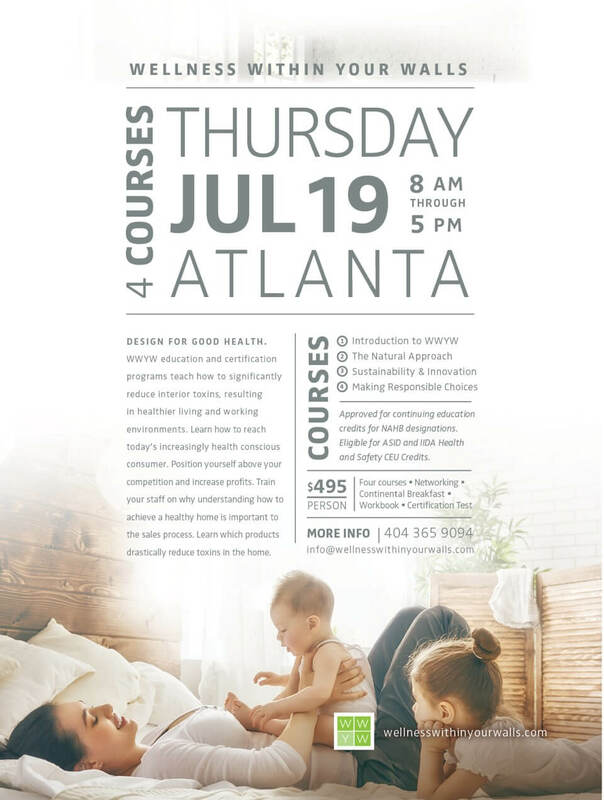 Wellness Within Your Walls® has produced a practical educational series featuring The Healthy Living System™, a 10-step approach to building and designing healthier living environments. 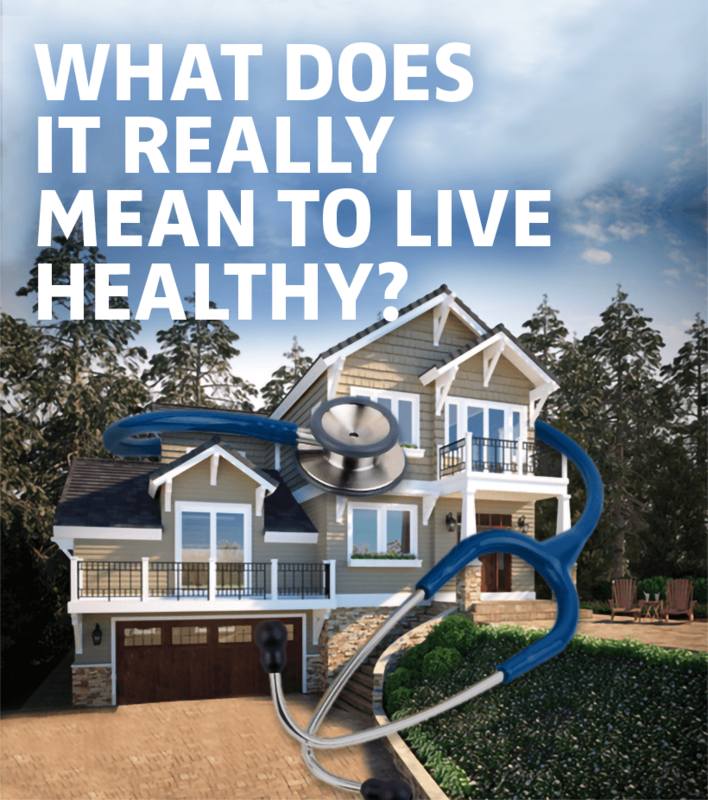 The Healthy Living System™ is designed to complement residential construction projects resulting in lower toxin levels and better health for homeowners. Recent scientific evidence indicates that air quality in homes tends to be significantly more polluted and harmful than outdoor air. People spend up to 90% of their time indoors. Analysis of indoor air and proper design of ventilation systems — with consideration given to available technology, climate zones and naturally-occurring toxins — can significantly improve this issue. Indoor air quality is especially important for at-risk groups such as the young, elderly, and chronically ill. A number of options exist to remedy these issues such as building with air-purifying drywall, whole-home air purification systems and even well-placed house plants. Hydration is paramount to human health. The water we consume plays a vital role in maintaining a healthy body and mind. Over 300 chemicals of concern have been identified in municipal tap water. Analyzing water for contaminants — through a consultant, local extension office, or public interest group database — is essential. Equally important is selecting the proper whole-home or personal water purification system to remove undesirable chemicals, biological contaminants, suspended solids and gases. Exposure to natural light provides the body with vitamin D, lifts moods, improves concentration, aids sleep, reduces signs of dementia and improves overall health. Our bodies rely on the daily cycle of natural light to synchronize circadian rhythms. Designing homes to capture and optimize natural light maximizes health while delivering energy-saving benefits. In the northern hemisphere, south facing rooms receive the most sunlight; rooms should be positioned to the sun’s rotation. Artificial light should be considered after natural exposure has been maximized. DO THE RIGHT THING. Build your business by getting certified and committing to The Healthy Living System™. Learn how you can reduce the level of toxins in the homes and products you build to reach today’s health-conscious consumer. And, certify your homes and products to create awareness of your commitment to consumer health, like the ABC Green Home 4.0 photographed above. Are you expecting? Need to know how to design a healthy space for your little babushka? 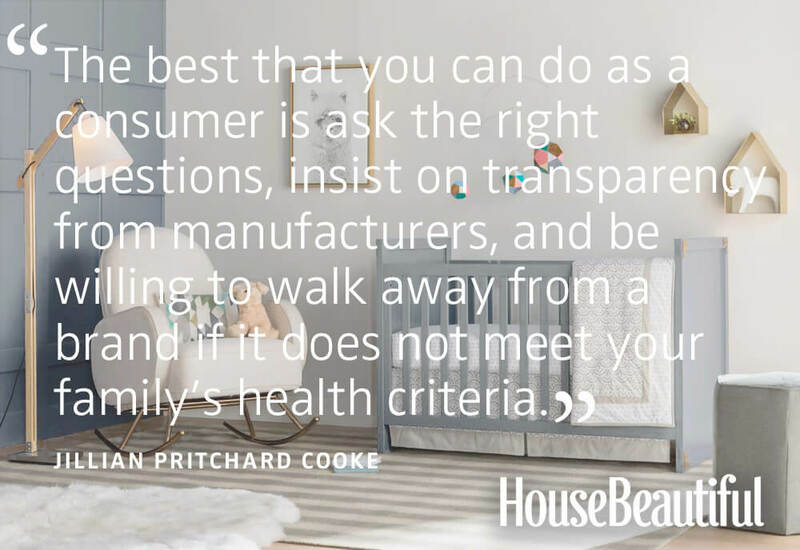 Our founder, Jillian Pritchard Cooke, was interviewed by House Beautiful for top tips. Read the article — 6 Nursery-Decorating Mistakes to Avoid for your Baby’s Health. It’s great information for expecting parents. 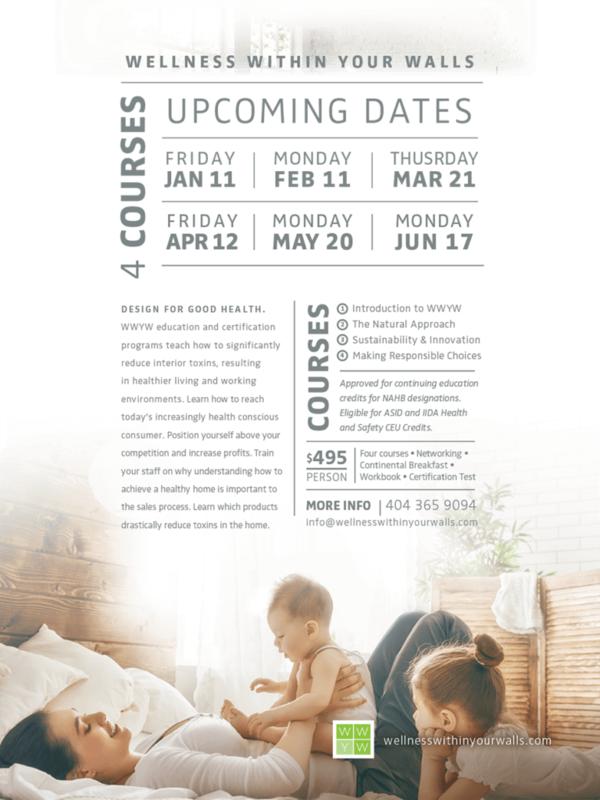 Please join us for our upcoming 4-courses. Choose one of the following dates to learn how to create Wellness Within Your Walls through our 4-course series. Stay ahead of the industry curve with the skills to optimize wellness within interior environments. At the end of each class date, there will be an opportunity to take a test and become WWYW Certified. Register online or reach out for more information. Making homes healthier: Jillian Pritchard Cooke knows that firsthand. A successful interior designer focused on sustainability, Cooke was working on a prestigious project in 2006 when she had a serious health scare. 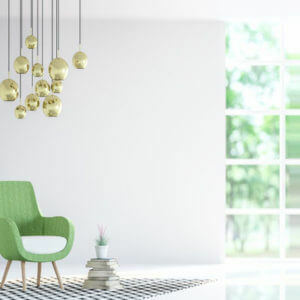 Now that you’re comfortably seated on a Wellness Within Your Walls approved chair, here are a couple of additions to make your living space really comfy—and non-toxic! From Pom Pom at Home, the Montauk (left) a beautiful lightweight throw in soft hues made of 100% organic Belgian Linen, which falls into our Natural category. The perfect weight for relaxing summer days! 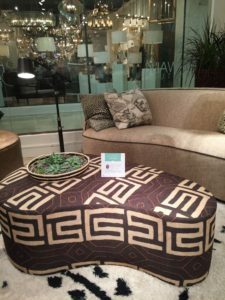 And for putting your feet up (or adding more seating), this very cool asymmetrical ottoman from Norwalk Furniture, the Nora (right). Made using responsible practices, and with a linen and cotton blend fabric, it checks all three of our categories—Natural, Sustainable and Responsible. We all certainly spend a lot of time sitting. Too much time, right? But if you choose carefully, you can at least make sure you’re not plopping down on a chair full of toxins. Today’s highlights from High Point–spots for sitting. 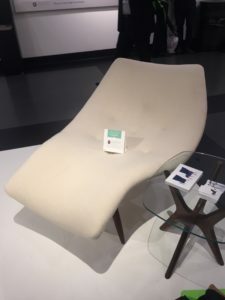 First, from Craft Associates, the oh so Modern Chaise Lounge which falls into all three of the Wellness Within Your Walls categories. It’s constructed with organic natural fabrics, wood species sustainably grown in Ohio, and natural foams and filler. Chic modern design meets a company with a responsible manufacturing process. 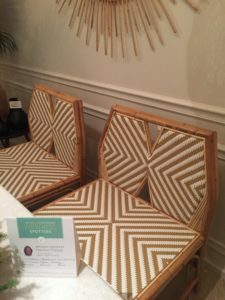 Next, another modern choice, the Lucia Mod Chair from Justina Blakeney for Selmat Designs, is made of rattan and finished with a water based sealant. The company was founded with a mission to create beautiful accessories with the leftover materials of the furniture industry. 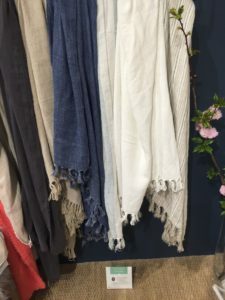 We love this bohemian chic indoor/outdoor line, which achieves our Natural, Sustainable and Responsible categories through its use of a natural, rapidly renewable reed. 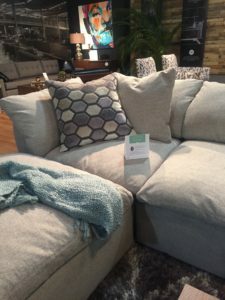 Last but far from least, the Bryan Sectional from Joybird which falls into our Sustainable and Responsible categories. Available in organic cotton fabric with Trillium fill–a hypoallergenic fill made entirely of recycled water & soda bottles. For every loveseat or sofa purchased, 2-4 trees will be planted, and, since all pieces are made to order, no materials are wasted!